Hi there, hope your weekend is going great! 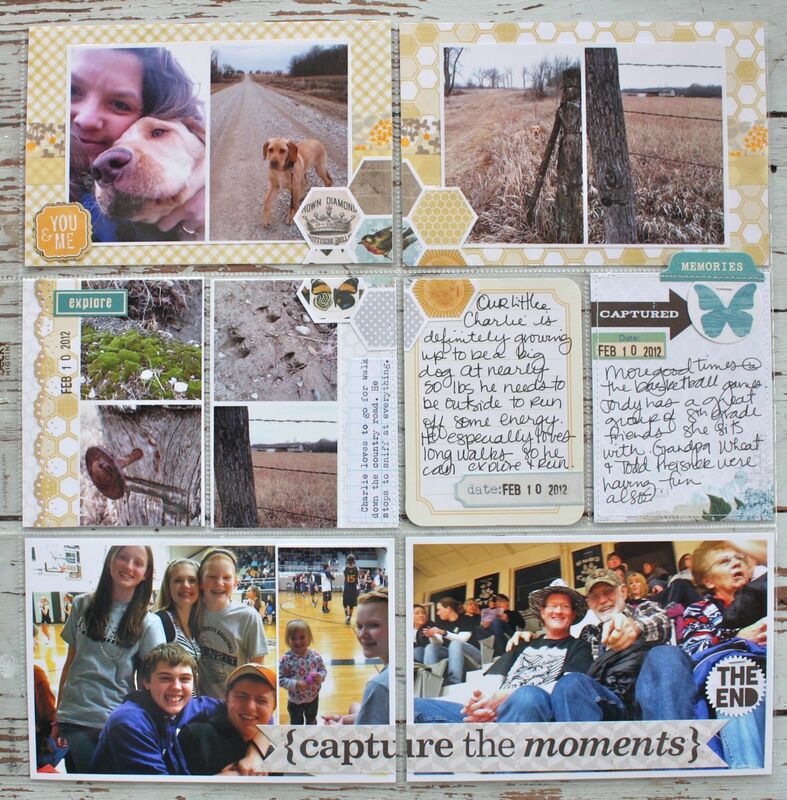 I'm back today with my Project Life Week 6 layouts. It took me a while to finish up this week because I had several inserts. 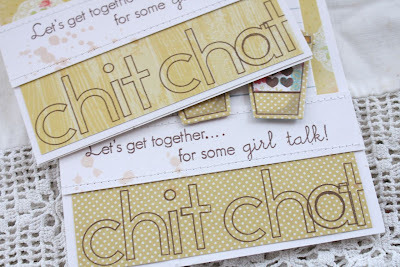 I'll try to keep the chit chat short since this post is so photo heavy. For products, I used papers and stamps from My Mind's Eye, Awesome & Epic Studio Calico stamps, various cardstock stickers from October Afternoon, Project Life journaling cards and folded journaling cards and a few items from my shop. Please leave comments with any product ? 's and I'll be happy to help. First up are my basic PL layouts without the inserts. I really loved the buttery yellow tone of the MME paper + I knew that I wanted to use the teal color here and there to tie in with my insert pages. 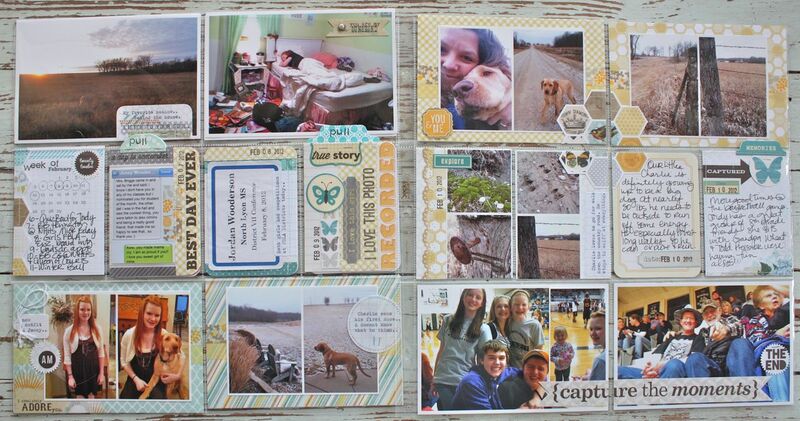 Here are my 3 x 4 journaling card inserts. I started off with a calendar card from Marcy Penner's shop. 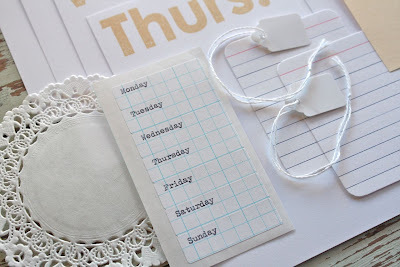 I cut paper from the MME collection + used a Studio Calico stamp that I punched out and I added some Hero Arts letters for the "week of" words. I found that a pencil with a missing eraser worked perfectly for stamping tiny circles around the calendar dates that marked this week. 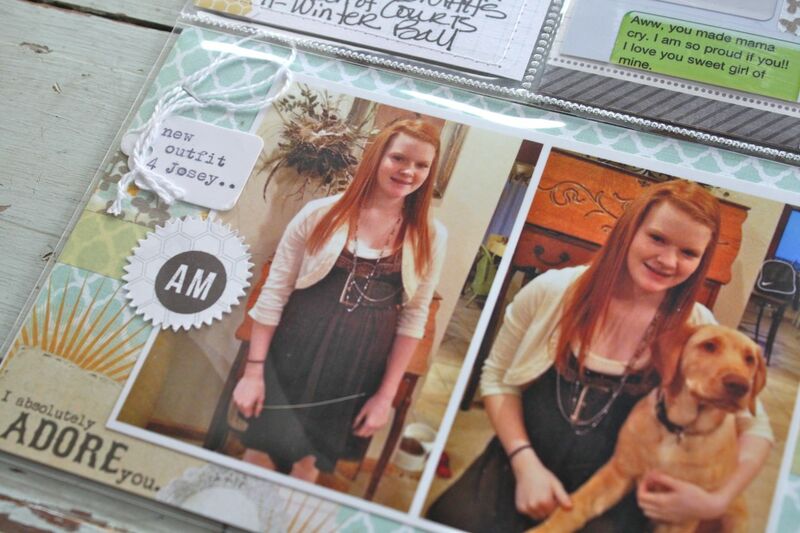 On the right is a text from Josey with a supporting story on the inside of the embellished PL folded journaling card. I used a sticker label with a stamped "pull" & staples to make a pull out tab. 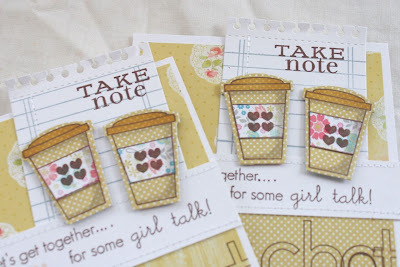 I also used Studio Calico stamps and Washi tape. Here I've got a name badge sticker from a school event Jordan attended this week + another folded journaling card with stamps, stickers and a pull out label tab. Here you can see the two folded journaling cards. 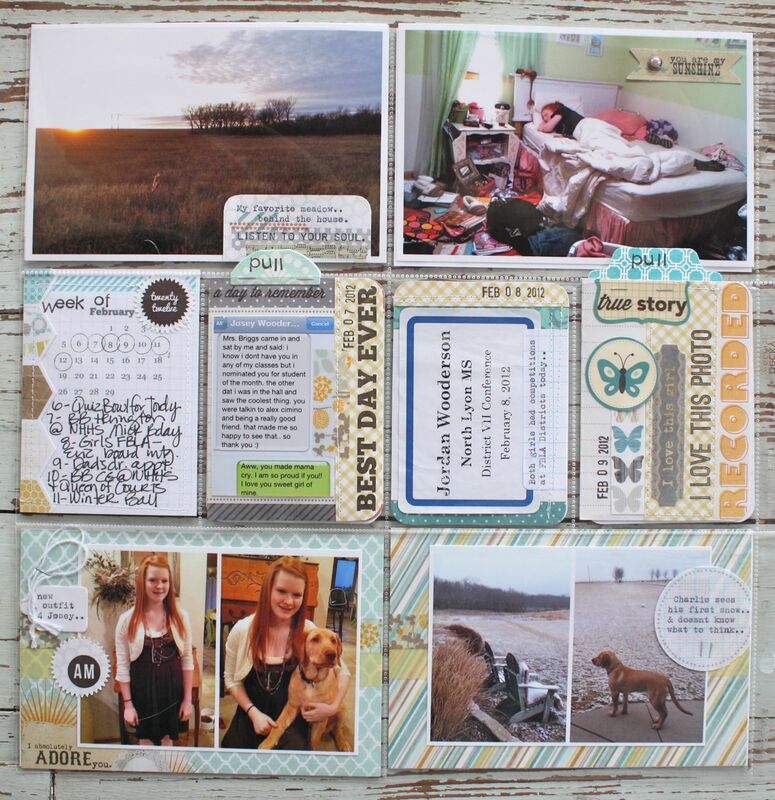 Perfect for adding additional stories without having to create a full page layout. Here I had lots of inserts that were used for photos of a walk that Charlie and I took down the country road. 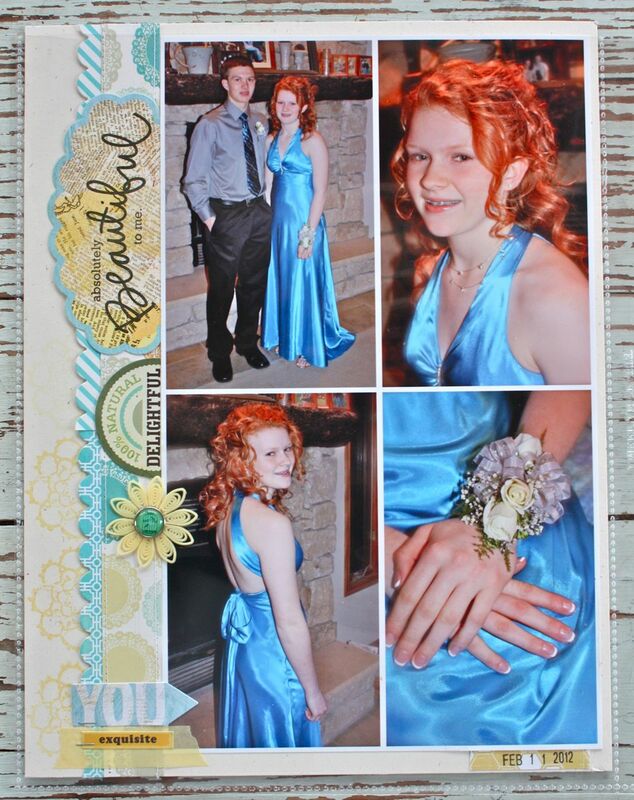 At first I wanted to create a separate insert but since I already knew I would have 2 extra pages this week, I opted to just fill several slots with photos. 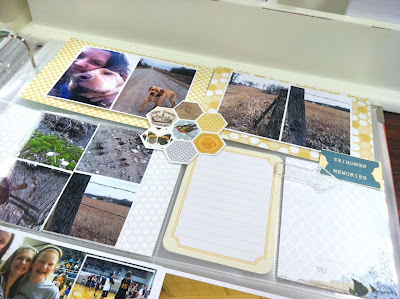 I tied all the inserts together by using coordinating papers from the MME collection + I cut out a honeycomb grouping of the hexagons then cut it into 4 pieces to spread out on the journaling cards. I love that look and how it ties 4 inserts together. 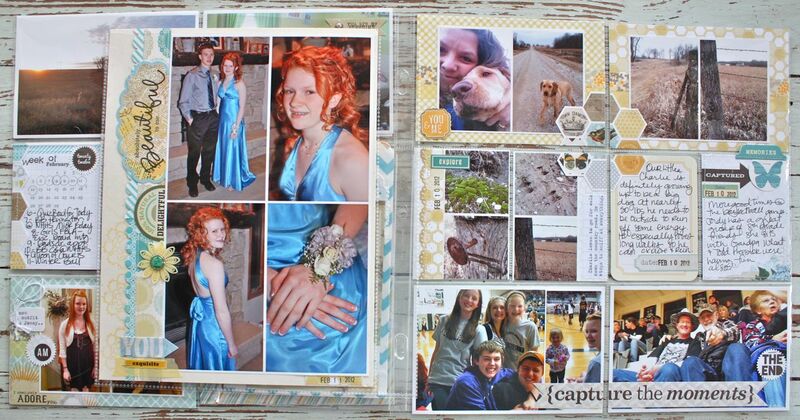 And here are some of the 4 x 6 inserts that I've embellished. On this insert I used Washi tape + a stamped circle + a small white tag from my shop that I typed on with my vintage typewriter. More Washi tape here + a vellum circle that was from a recent kit in my shop. 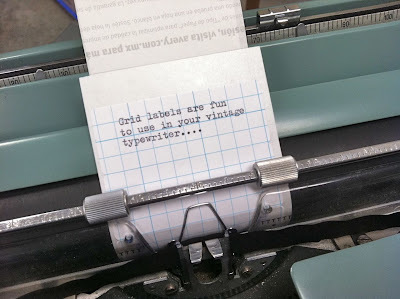 I typed on it with my vintage typewriter and adhered it with my tiny stapler. 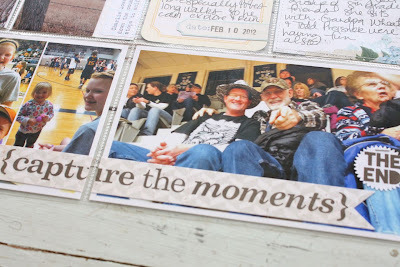 On these two inserts that feature photos from the basketball games I used a long Scrappy Words stamp that Stamping Bella sent to me. The stamp is really long so I spread it across two photos. Here are my pages with the inserts shown. For all of my inserts, I like to keep them smaller than a 12 x 12 size. 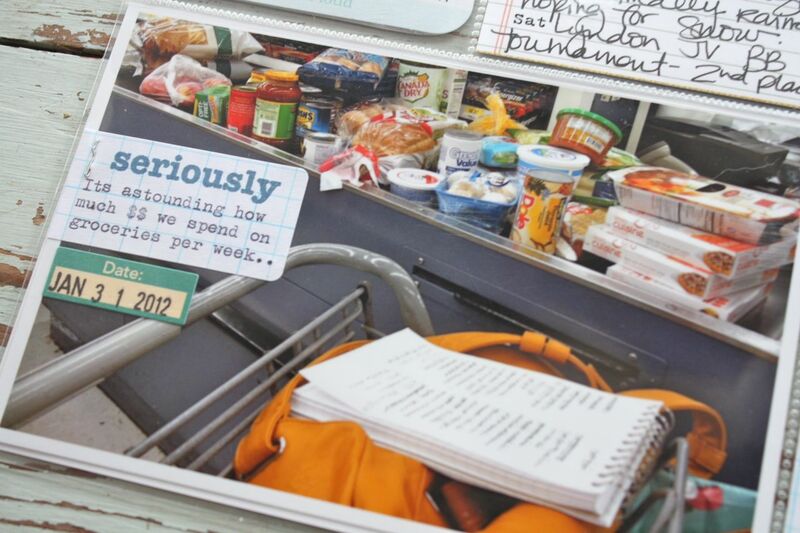 This way you can see the main pages and know that the smaller pages are supporting inserts that tell more stories. 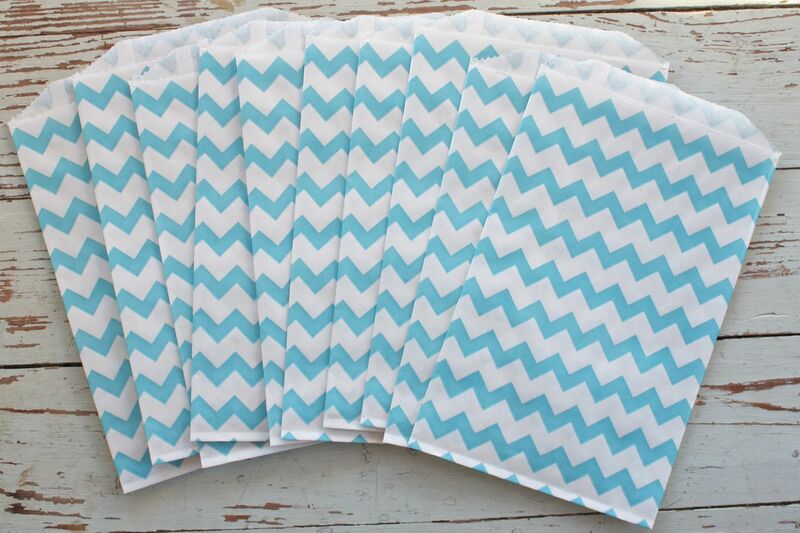 This week I used an 8.5" x 11" insert + a smaller insert with a chevron sack. Here's the back side of the 8.5 x 11 insert page. 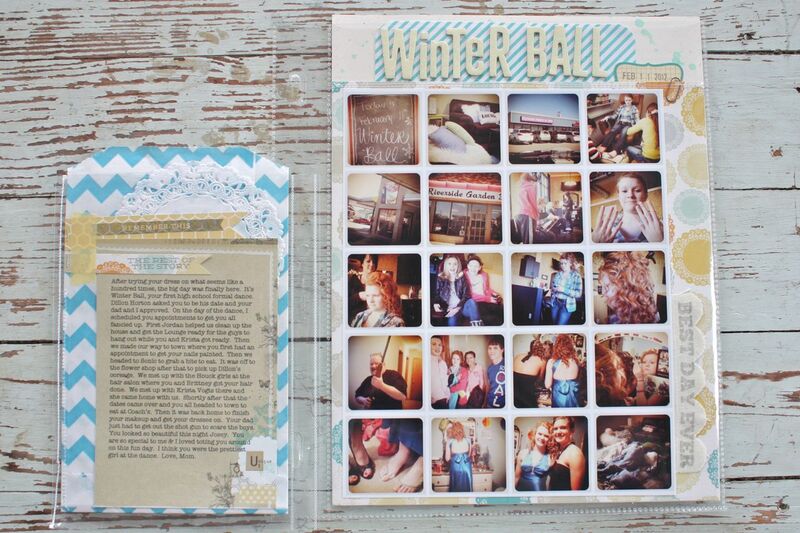 For this insert page I used a ton of small Instagram photos that I took on Josey's big Winter Ball day. It was a Day in the Life of sorts, inspired by Ali Edwards. These photos show our happenings before the dance itself....getting her nails done, picking up the corsage, eating lunch, getting her hair done, etc. 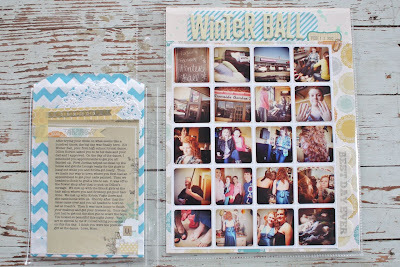 The small Instagrams are such a fun way to incorporate lots of photos. You'll also notice the chevron sack on the left. 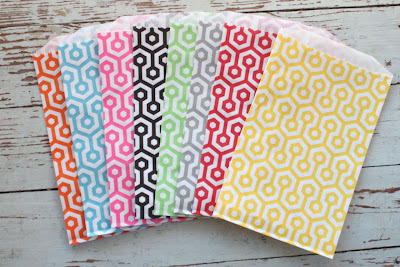 I recently updated my shop with lots of color and styles of sacks. The small sacks fit just right in the 3 x 4 page protector slots and the larger sacks are great for small inserts. You can see a sample of a smaller sack in a 3 x 4 journaling slot here. For this sack, I fit it into a Project Life 6 x 12 page protector that was cut down to size and stitched with my sewing machine. I'll use this sack to hold extra photos that I took of Josey in her formal dress. I embellished the front of the sack with a PL journaling card that has stitched on patterned paper + stickers + a grid label from my shop. 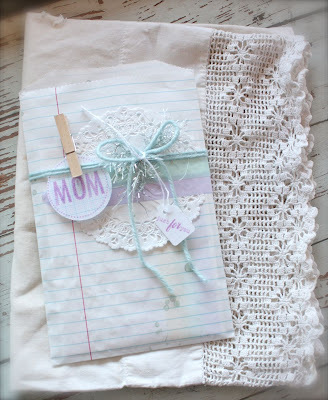 On the back side of that sack, I added a piece of printed journaling + some stamped pieces from Studio Calico + a doily. 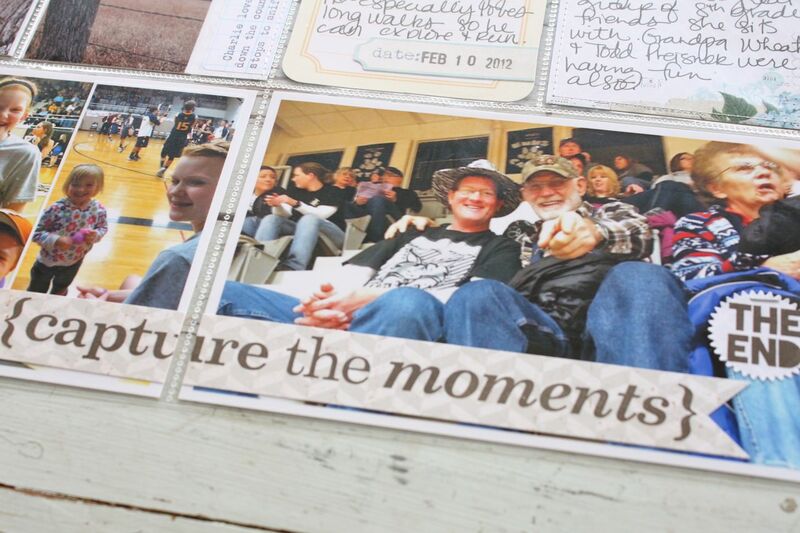 Here's the second page of the insert, a few of my favorite photos just before the kids left for the dance. I'm so happy that I captured Josey's first high school dance. Such fun memories. I printed the 4 photos off on one sheet of photo paper and trimmed off the excess. I used stickers from my stash + a fun plastic flower from Jenni Bowlin with a brad. Whew, what a week. I've got about the same scenario for the next coming week because Jordan had a formal junior high dance too that I took lots of photos of. Stay tuned and thanks for stopping by. Thank you so much for all of your orders from my little shop. Once I get the current orders packaged and mailed off, I'll be taking inventory and re-stocking a few more items such as the sacks, tags and grid labels by late Monday or Tuesday. I'll also be stocking lots more fun tags soon. I'll be adding some new items to my Big Cartel shop at 1:00pm Central Time today. You can find my shop here but it will not show the new items til 1:00pm. 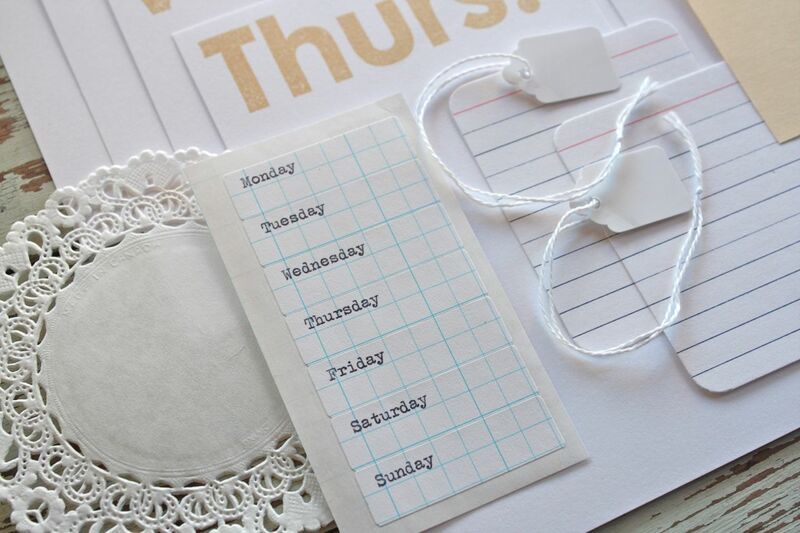 Fun Days of the Week Kit, perfect for Project Life. All kinds of new small and large sacks. If you love chevron, you're in luck! 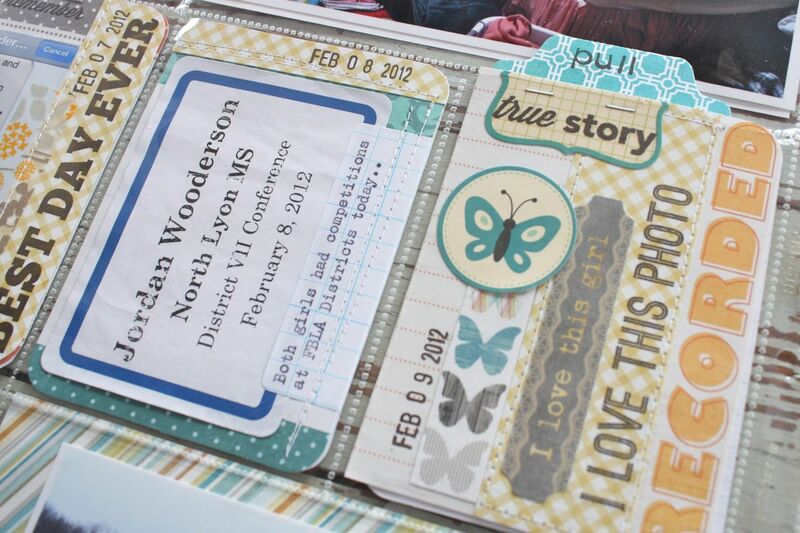 Or to add to scrapbooking projects like Project Life inserts and journaling cards. 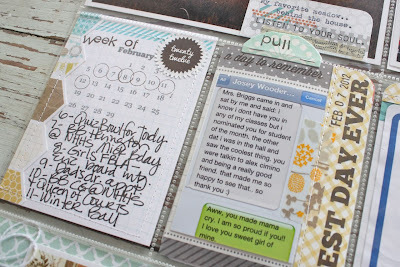 Here's a fun idea I'll be posting with my next Project Life weekly update. 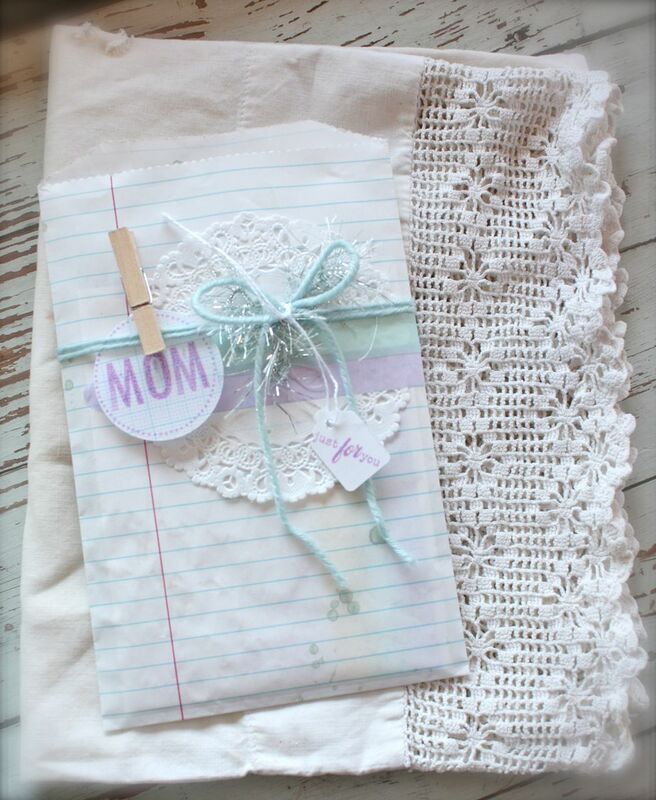 Use the sacks to hold extra photos....and the back side has journaling. There will be more items in the shop too! I ship everywhere and payment is through PayPal. I have to run make a dessert for a school supper tonight and Miss Josey Posey didn't get her uniform washed for tonight either.....a mother's job is never done, right? I'll catch ya back here soon! Thanks for stopping by. 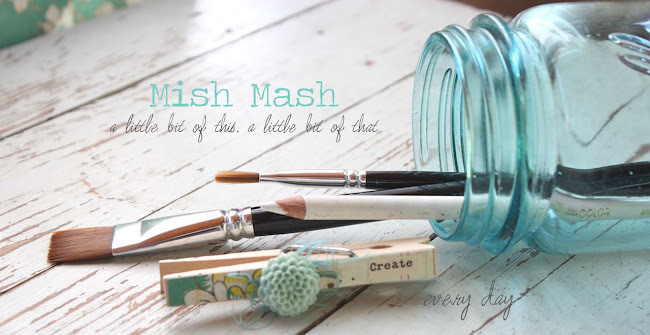 Back today with the first post of a mini series I'll be doing on Pretty Little Packaging. I'm always listing packaging kits in my shop & have lots of fun packaging items for sale so I thought I would do a few posts on how you can use my products to create fun, handmade gifts + pretty little packaging to coordinate. 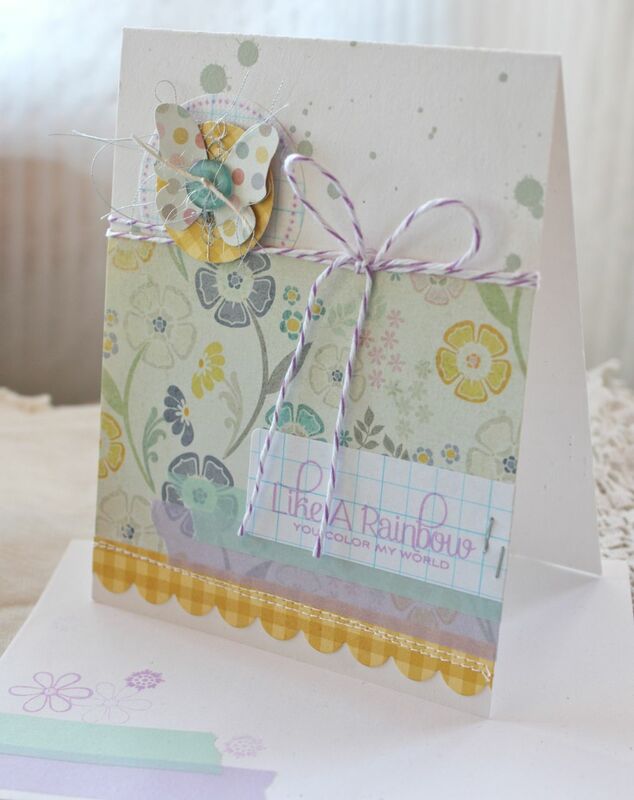 First up today in my mini series is Cards as Gifts. I think it's so fun to be a paper crafter because you can scrapbook, make artwork, create cards & gifts and then wrap it all up in fun packaging. With my packaging kits that I offer like my recent Fly Away Butterfly Packaging Kit, you receive sacks and other embellishing goodies to help you create fun gift wrap for cards or other small gifts. The kits are intended to be used with crafty items from your stash. Today I used some of the kit items + beautiful new My Minds Eye papers from the Miss Caroline collection, Washi tape and baker's twine. Let's start with the packaging first since that's the main elements of the kit. I used the lined notepaper sack and layered it with a Dainty Doily, Washi tape in pretty purple and aqua, the cotton yarn and eyelash ribbon, the linen textured circle accent, small white tag and the clothespin from the kit. I first splattered a little spray mist from October Afternoon onto the sack. I also did some stamping. I used Friendship Jar for the small white tag. 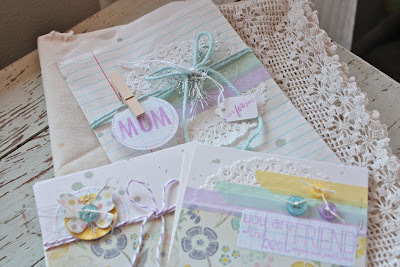 For the vellum circle I stamped "mom" using Studio Calico's alphabet set that came in the Stepping Stone kit. Here's a great tip I like to give for gift packaging: I love to customize packaging with a name because I think it's so personal. But then what does someone do with the packaging? 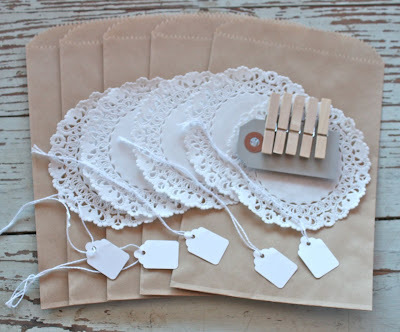 By stamping the name on a separate piece like I did (you can see below), you can attach the personalized tag to the gift with a clothespin......then that piece can be removed and the recipient can "re-gift" your packaging. It's recycling at it's best! I love to keep a few of these already made packaging items in a small basket to have on hand. 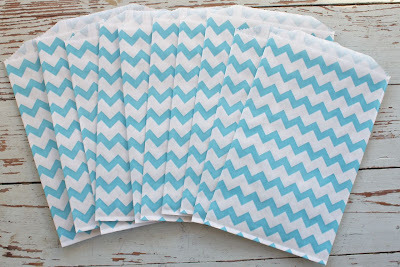 They're just the right size for tucking in a few cards or other small gift items. To go along with my packaging today I've created two cards that coordinate with the packaging. I'll keep the cards + the packaging together for a unique, hand crafted gift. I find too that the more of these little gift type items I have on hand, the more likely I am go find a reason to give a gift. Like a teacher, a friend for picking up your child, a sick relative, Mother's Day gifts, birthdays, etc. And sometimes you want to give a gift but you just don't want to spend a lot of money. Cards make the perfect gifts! 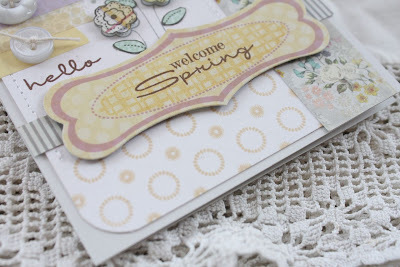 My first card features a Dainty Doily and the stamped grid label from the kit. I used My Mind's Eye Favorite Stamps from the Miss Caroline Collection for the cute sentiment + more of the MME patterned paper. 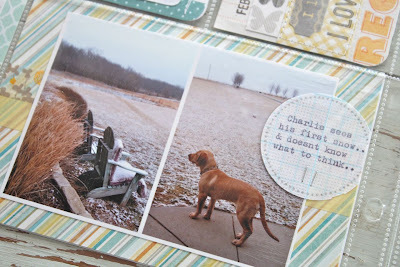 The base for my cards today is Rustic White. I also used 3 colors of Washi tape, a new crafting favorite of mine. 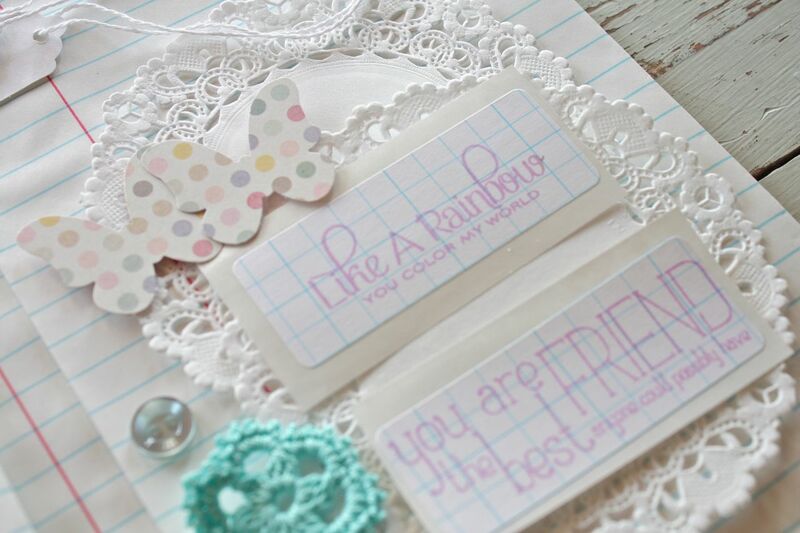 You can find them in Etsy shops or Big Cartel shops everywhere, just search for "washi tape". 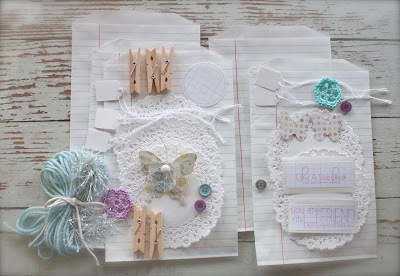 I also added a few tied Vintage Buttons from Papertrey + some mini staples. 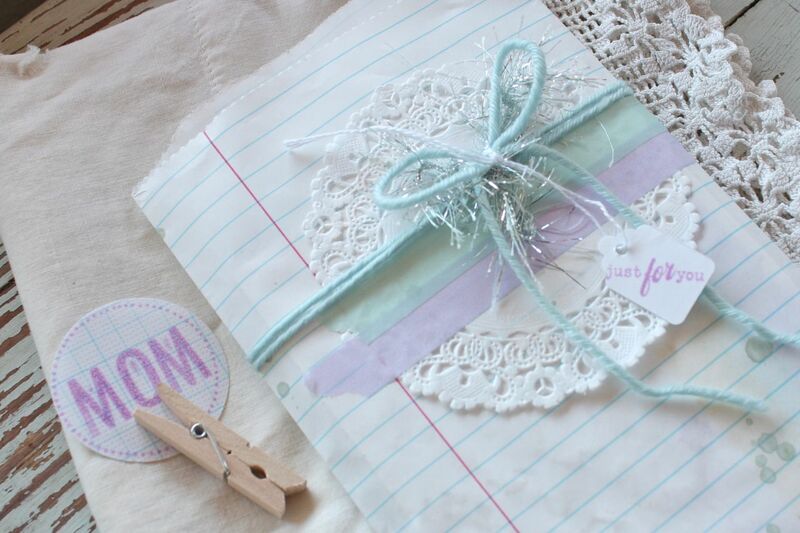 My envelopes are also embellished with stamps and Washi tape. 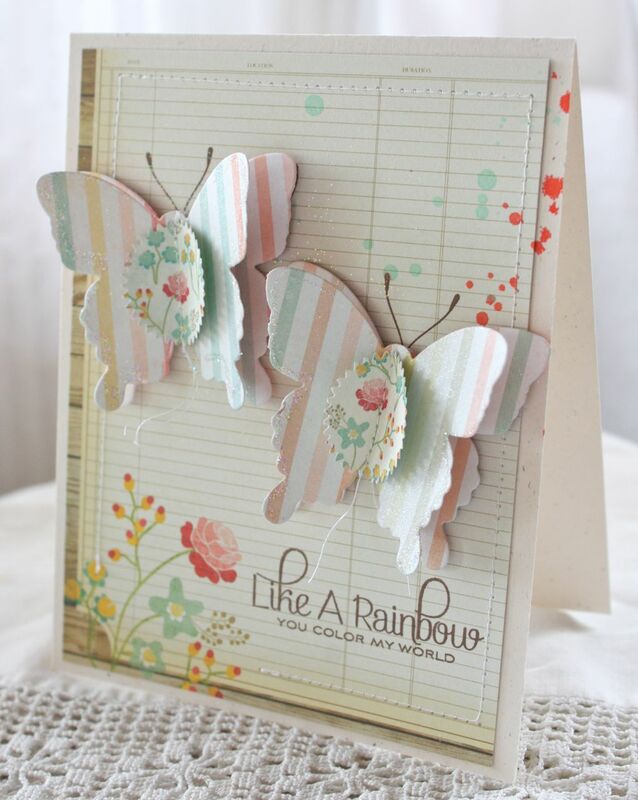 Here's my second card which uses the stamped vellum circle, stamped grid label and the punched butterfly from the kit. 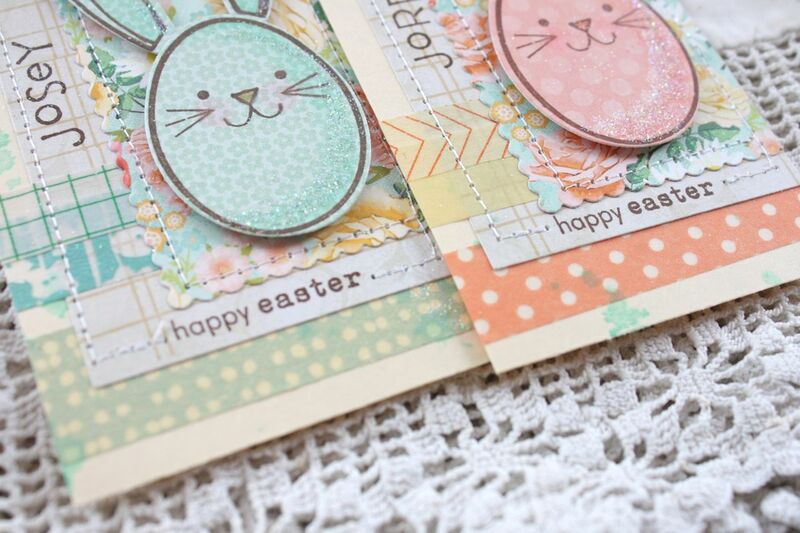 Both cards have a scalloped border using Papertrey's small scalloped border die. 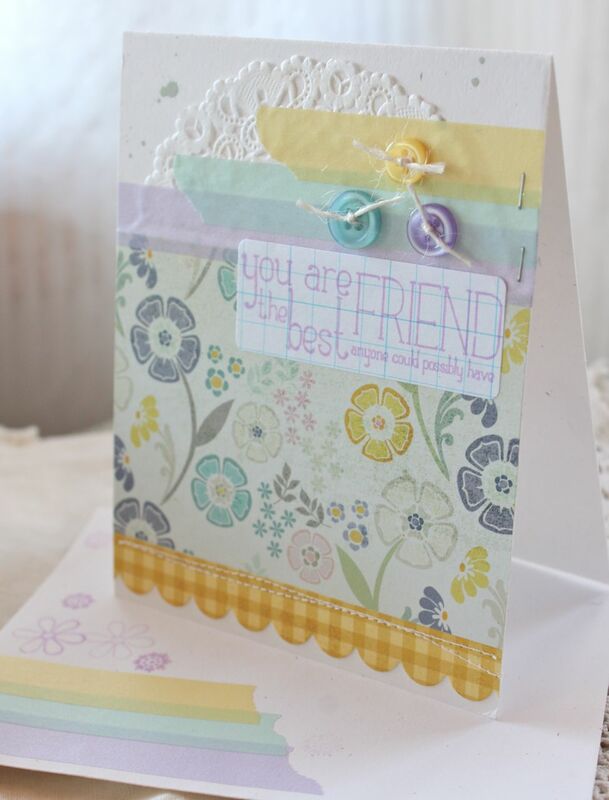 This card also features purple baker's twine. Here you can see the tops of both cards together. I think it's fun to make sets that use coordinating product but that are a little different from each other. And here's the bottom of the card with the stitched scalloped border. A fun little gift set of cards with pretty little packaging to boot. Hope you give it a try. Stay tuned for a few more posts for my Pretty Little Packaging mini blog series. 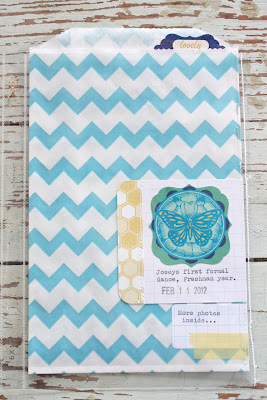 Coming up next is a fun gift idea that's a favorite here on the blog. I'm expecting lots of new sacks this week so I'll be posting shop update times soon. 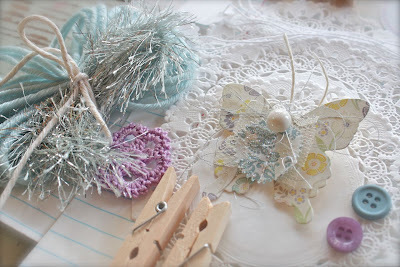 Plus I'll be adding a limited supply of the fun cotton yarn and eyelash ribbon(see the butterfly kit in the shop for examples) in lots of pretty colors. 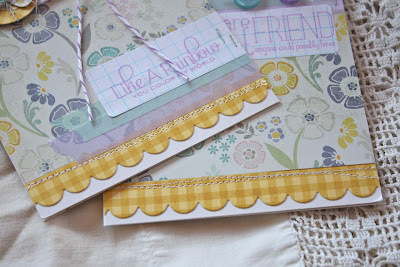 My next week of Project Life will also be coming up soon which includes some fun insert pages. Thank you for stopping by! Hope your weekend was great. It's so nice out, I'm off to walk Charlie! Just added a handful of these Fly Away Butterfly packaging kits to the shop. I'll be working this weekend to show you a few samples. I'm going to use these as gift packaging for cards that I use as gifts. Just a few cards and maybe a piece of chocolate makes a great little thank you gift....or perhaps just a nice gesture for a friend. Pretty little accents including this hand crafted butterfly layered with lace, glittered punch, messy string, vintage button and cotton twine for antennas. 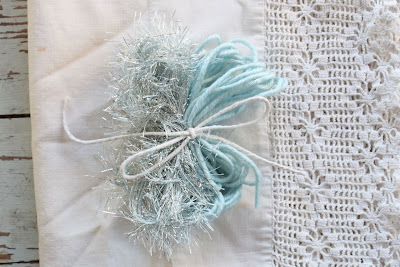 The cotton twine and eyelash ribbon are something brand new that I'll have in the shop soon too. 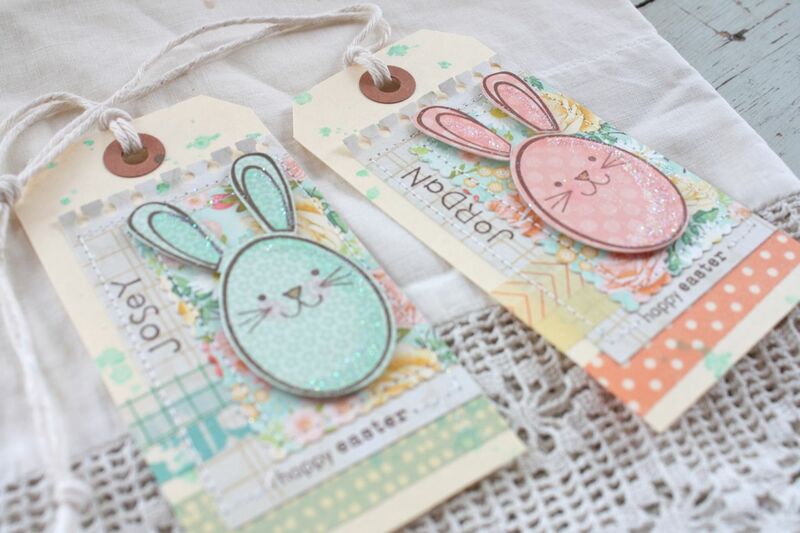 Plus I've added a few stamped grid labels to use on the sacks or for embellishing cards. It's PIP Day for Week 6 of my Project Life. 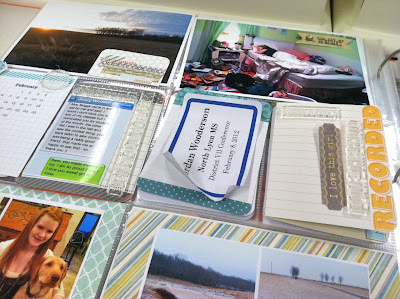 PIP Day is where I snap a few shots of my Project Life in Progress for the week and offer some open discussion topics. Still loving PL, still going strong. 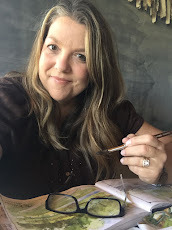 This week I enjoyed sorting through my newest stash of My Mind's Eye products I got from 2Peas, particularly the Be Amazing Follow Your Heart line. The colors in this collection really coordinated well with my photos this week which had lots of blues and golden yellows. 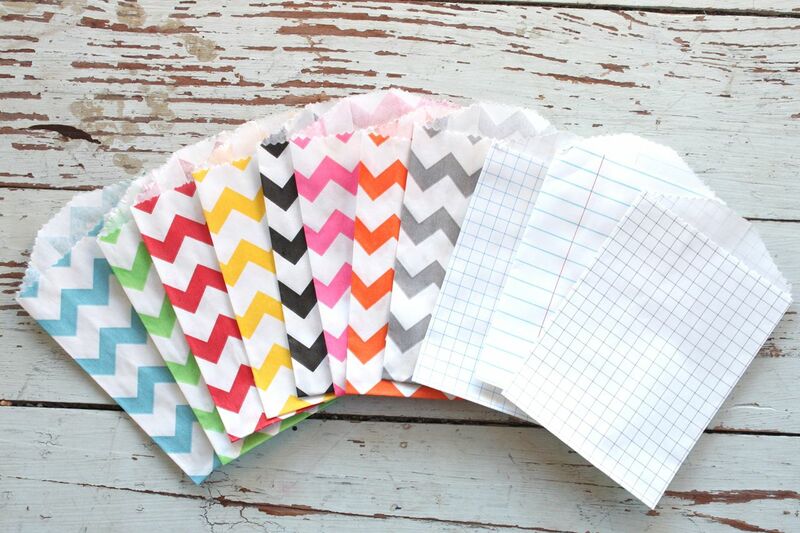 The 6 x 6 patterned paper pad gave me lots of fun patterns to choose from. 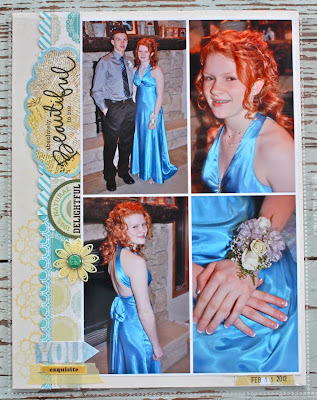 I'll be adding inserts this week from Josey's Winter Ball which will have mainly a bright blue color from her dress, so these colors will coordinate well with those pages too. 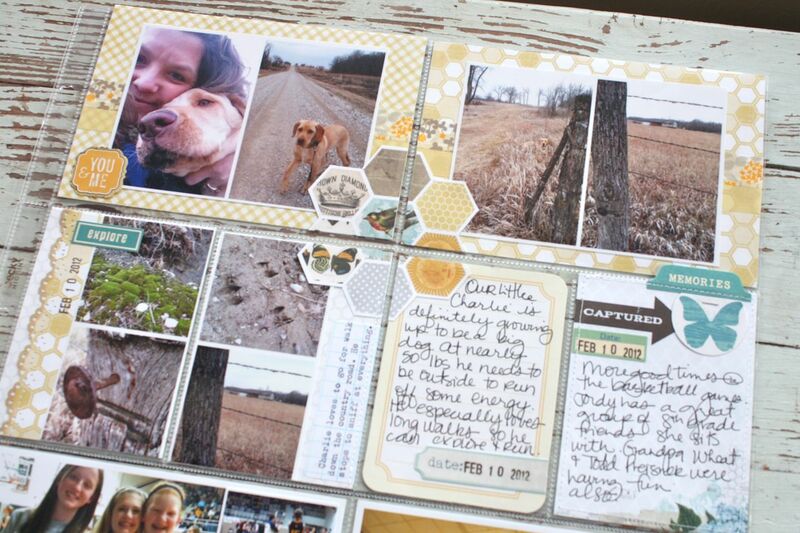 I'm also excited to also break out my new Studio Calico Awesome and Epic stamps, perfect for Project Life. So what are your thoughts on Project Life so far this year? I am still loving the process. I'm reading a lot about some of you getting behind, perhaps not even starting, and getting a little overwhelmed. Project Life is definitely a work in progress. It takes a fair amount of devotion of time, planning and effort for sure. With jotting down notes in my calendar, planning out my layouts, printing photos at home and the time I work on my albums.....I am probably spending a good 4-5 hours total on this project a week. I dabble with it here and there and that is the fun of it for me. 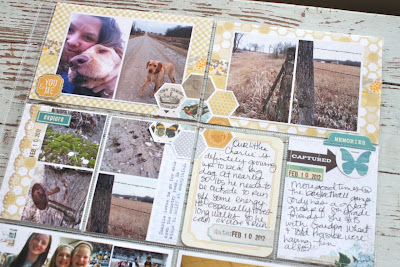 I get to work on little pieces at a time and it's the perfect scrapbooking fix for me. Aside from additional inserts, this is the extent of my scrapbooking (maybe a few mini books here and there). 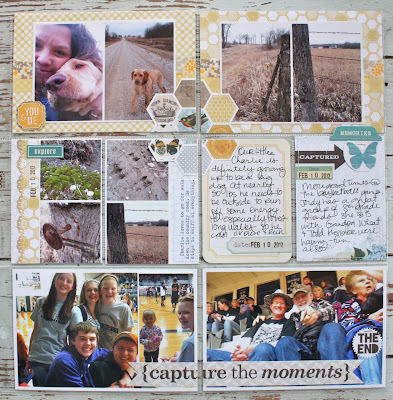 So the time spent on my Project Life albums is very rewarding to me. To see 6 weeks down in the books is really great. This week I want to tell a few more stories in depth. 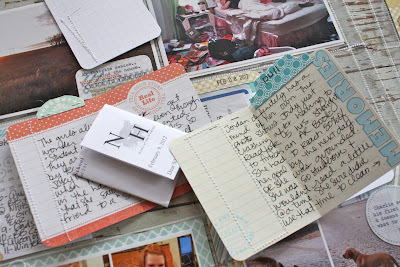 I've got two Project Life folded journaling cards ready to use. 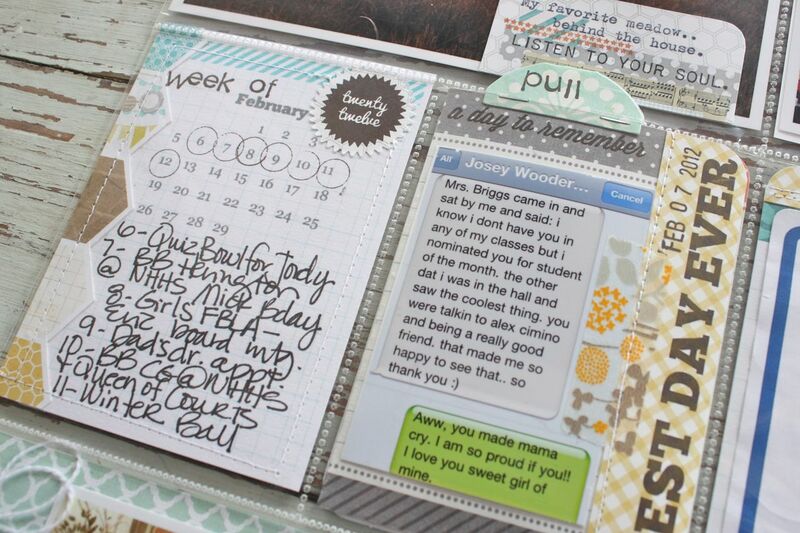 I like that I can add in more journaling without adding additional inserts. I'm also trying to condense some photos down so that they fit into the main pages instead of adding so many inserts. I did this with some photos I took while taking Charlie for a walk down our country road. Was totally planning on an insert page but then just printed smaller photos so they fit in the main layouts. 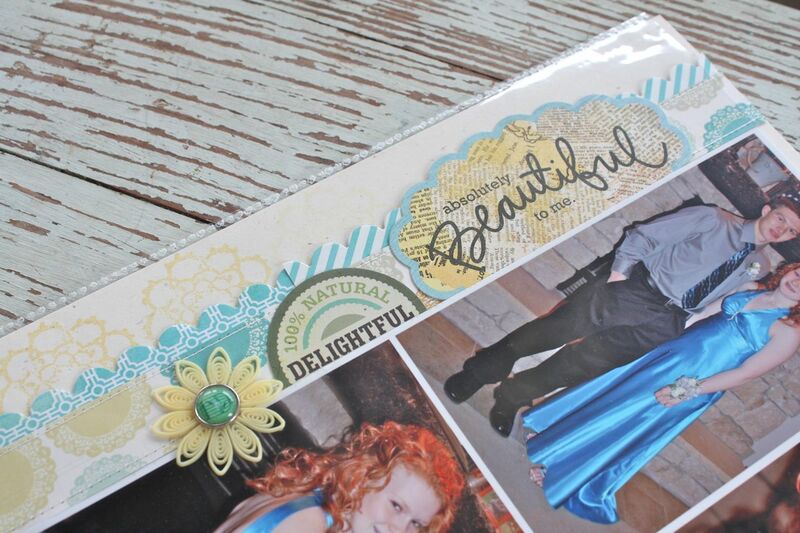 My challenge is to tie those photos together somehow using embellishments and coordinating papers. 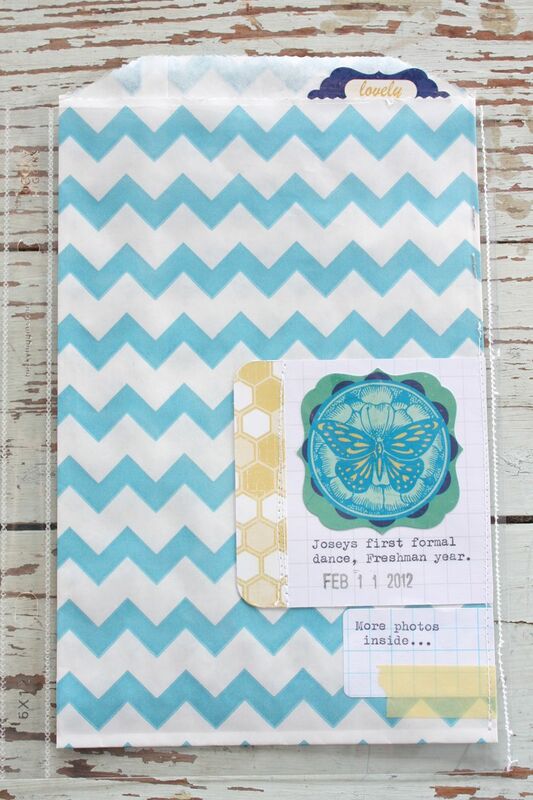 I've got a fun idea planned for those hexagons I hand cut from the MME patterned paper. My inspiration this week is coming from my past Project Life albums. I'm setting them out and going back to the same months from a year ago. It's so fascinating to see what was happening then. My hopes for my Project Life albums are to finish albums throughout the girls' high school years. 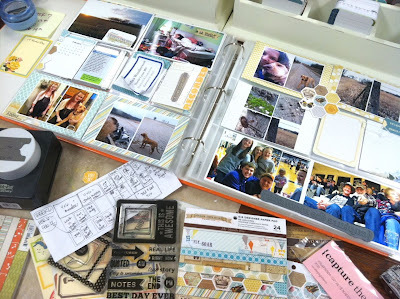 Then when they leave the nest I'll evaluate how I want to scrapbook with Project Life. 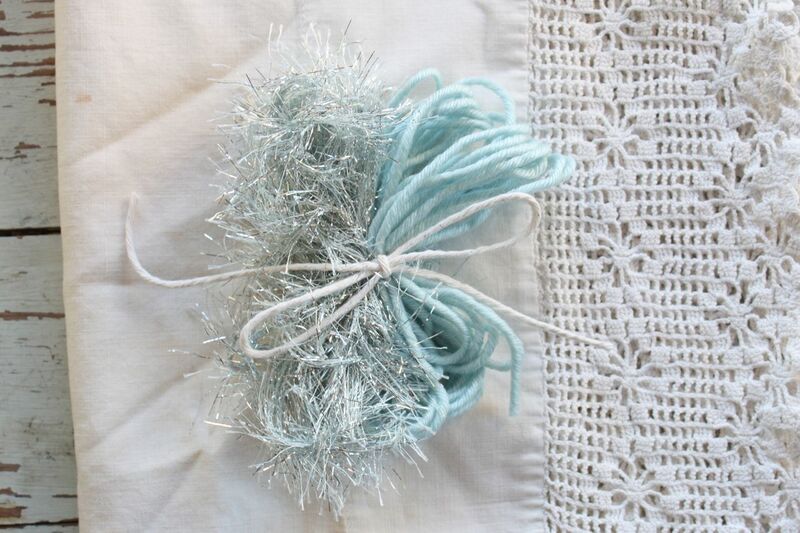 I'll be receiving lots of new designs of sacks next week so stay tuned for a shop update. I'm also going to be adding more kits to the shop here and there. 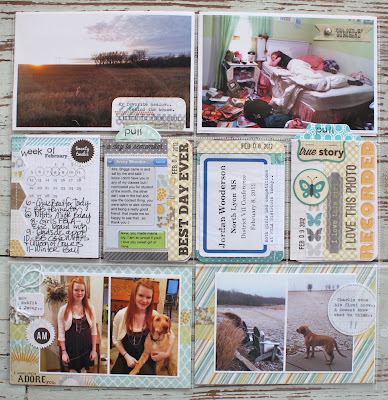 I've got a few of my button card kits + my Gray & Grid kits left too. Lots of restocks coming in the near future which I'll add to the shop as I get orders in. Thanks so much for shopping with me. 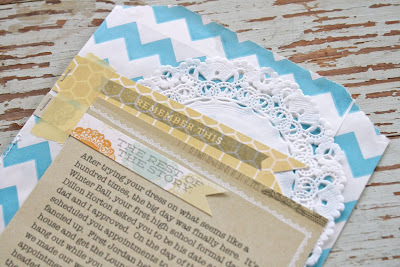 Today I have my Papertrey projects from this month's release to share with you. 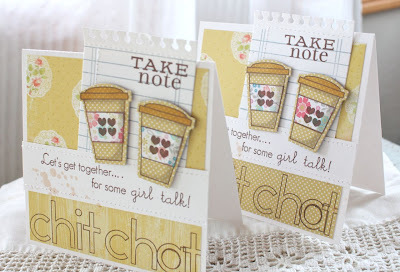 This release was full of fun & fresh new stamps plus lots of coordinating product. 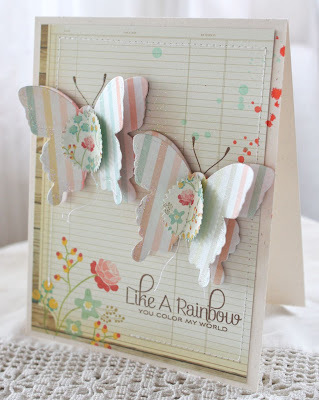 First up is a card made with Maile's new Beautiful Butterflies set and coordinating dies. Some of the most creative butterflies I've seen on the market. 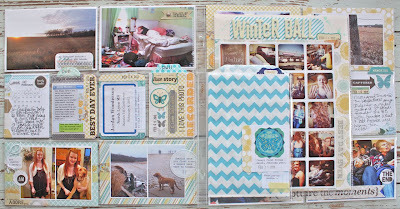 I particularly love the dies and all the layering possibilities they offer. And the fonts and sentiments are a treasure in themselves. 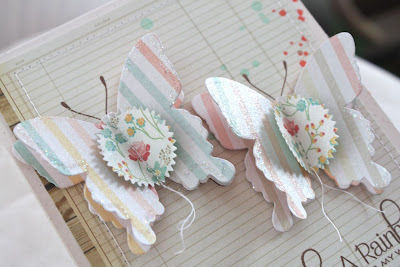 I layered my butterflies on a piece of My Mind's Eye patterned paper that has been splattered with spray ink and stitched. Die cut butterflies are layered and stitched, then sprayed with shimmery mist and finished off with more glitter around the edges. I left the strings from machine stitching long to create butterfly tails. The sentiment plays into the soft rainbow stripes of my butterflies. My favorites this month, these tent topper cards made with Melissa's new Heart-2-Heart #1 stamp set and dies. This is a new series of stamps with each month featuring hearts. I can't wait to see what's in store. 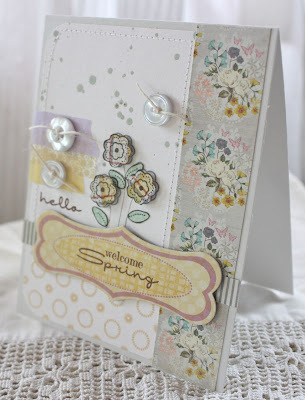 For the card topper, I used the spiral notebook die stamped with Heather's ledger stamp and a sentiment from Take Note. Card base is 4.25" x 4.25". 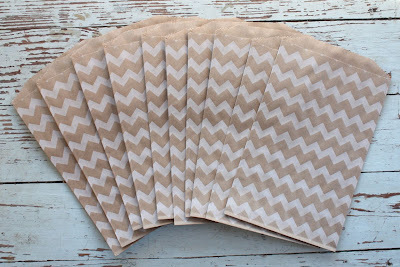 Coffee cups were die cut and paper pieced using My Mind's Eye patterned paper. I then colored the images with Copic Sketch markers. 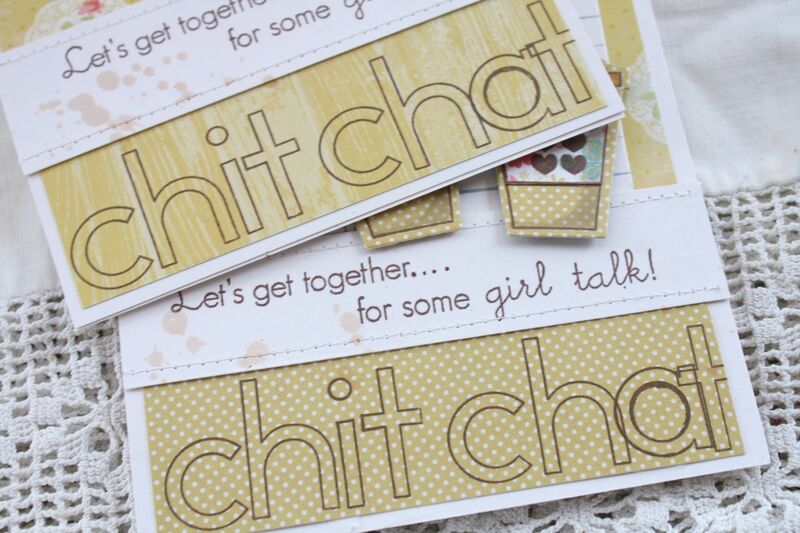 To tie in with the girly sentiment I added some stamped letters to spell out "chit chat". 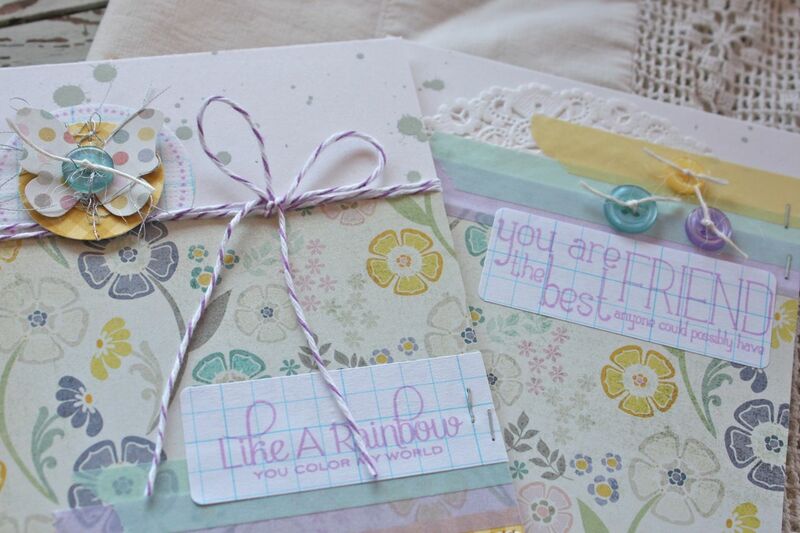 These cards will definitely brighten some one's day. 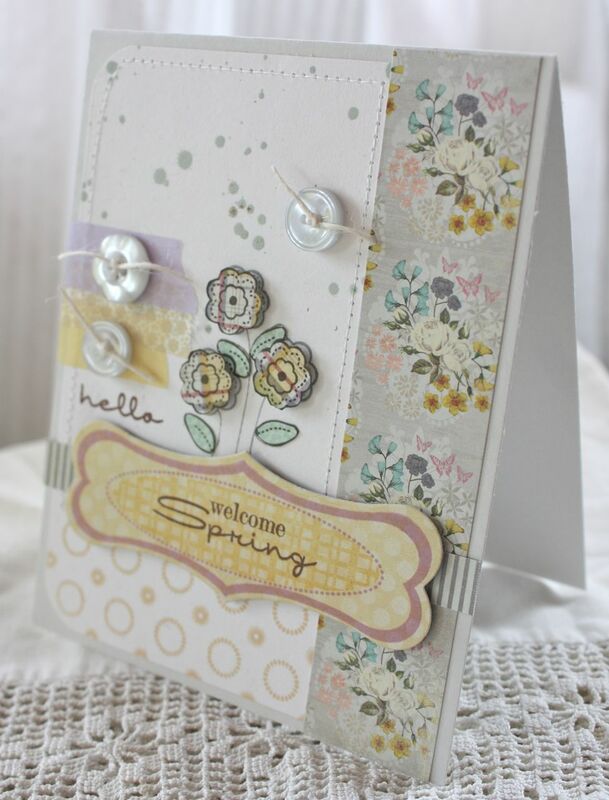 Next up is a springy card created with Lisa's new Sweet Spring stamp set. The labels in the set coordinate with her Christmas labels. I love the oval fillers in this set. 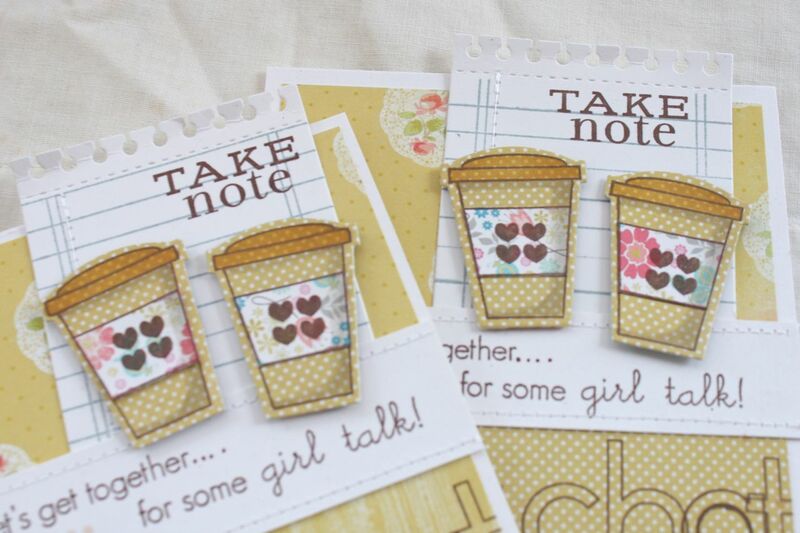 I stamped the flowers and paper pieced the flowers and leaves with My Mind's Eye patterned papers. 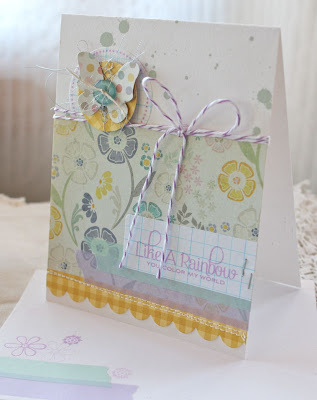 Washi tape, Vintage Buttons and ink splatters adorn the front of the card. 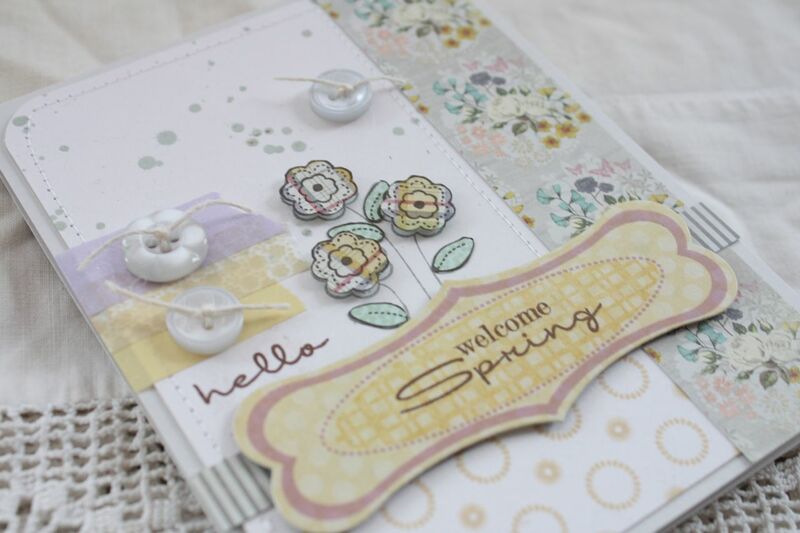 On the bottom of the card I stamped the new Background Basics: Medallions. 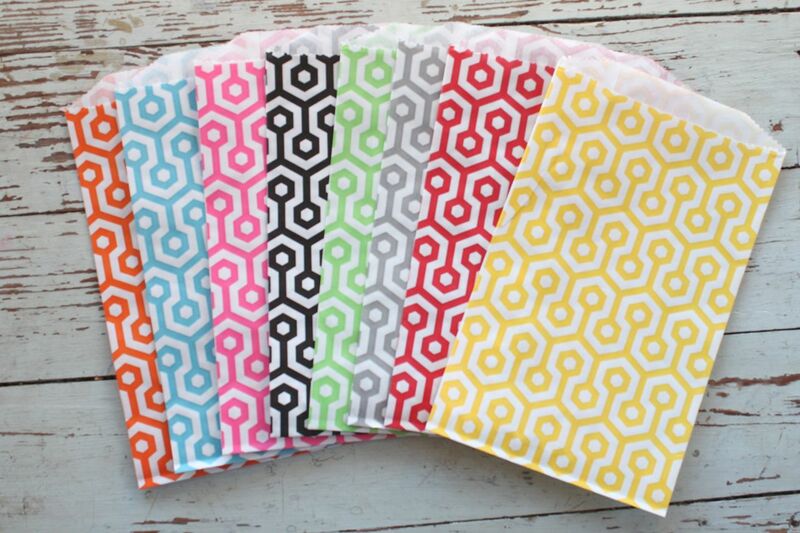 A perfect background set for adding a little pattern. 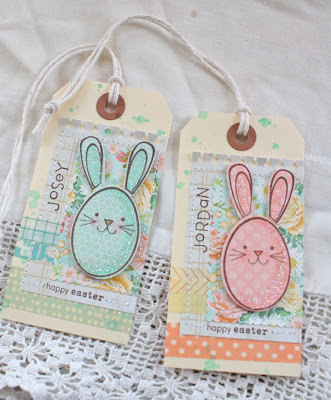 And last but not least I created some Easter tags for the girls using Heather's new Scrambled Eggs stamp set. The name of the set is so clever and the images are just as cute. This set coordinates with the previously released Egg Hunt set and die. The addition of the cute bunny ears and face stamp is so adorable. 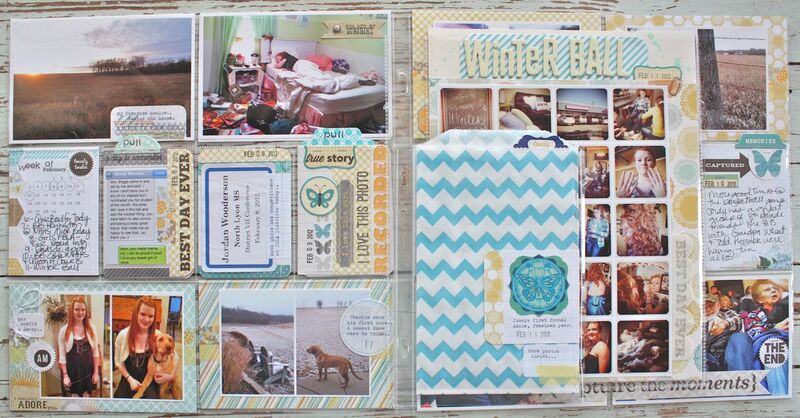 On the tag base, I layered lots of My Mind's Eye patterned papers with colorful Washi tapes. I then stitched over all the layers. 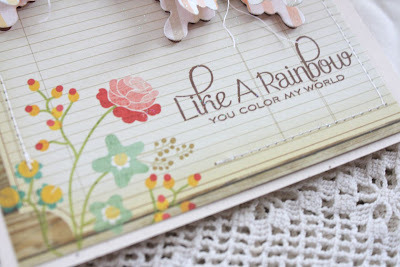 Such a fun way to add lots of color to a project. The girls' names were stamped with Hero Arts letters. I shaded the bunny faces and ears with Copic markers. Adorable little tags just waiting to be tied to the girls' Easter baskets. It always feels good to be ahead of the game.